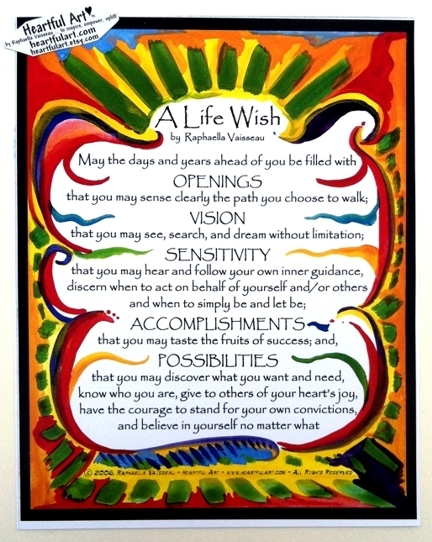 Raphaella Vaisseau's inspirational words for NEW BEGINNINGS, NEW YEAR, GRADUATION: "A Life Wish" on an 11 x 14 poster. These original words comprise what I would give you if I could give you anything in the world. It's a blessing and a wish. Raphaella's "A Life Wish" poem has been read at many school commencements across America, and included as inspiration in a speech by the Honor Society President to the Indiana University School of Nursing at their Nov. '05 Convention in Indianapolis. Dream big. Love yourself. Be happy.